This is a photo from the job we did yesterday. 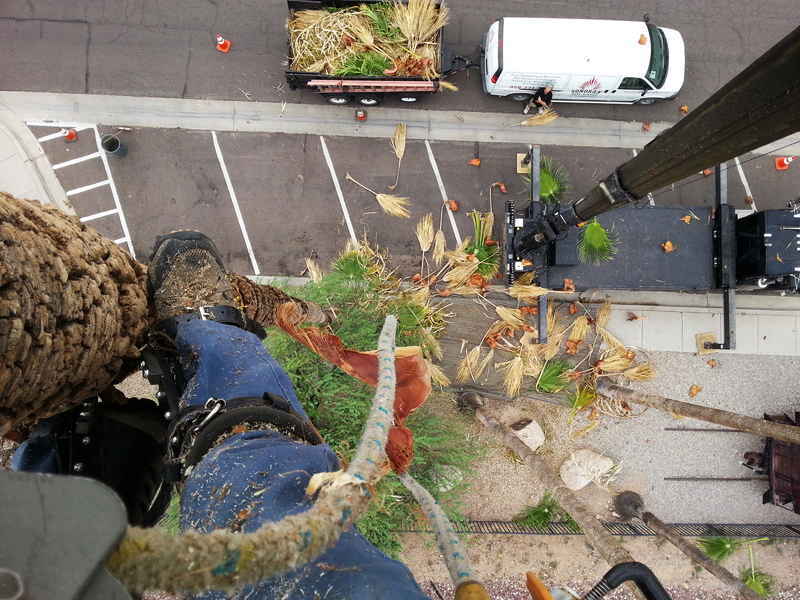 There are 4 very tall (87ft) Mexican Fan Palms near the Wickenburg Chamber of Commerce that had not been trimmed for at least 7 years. I was asked to bid the job and wanted a safe way to access the trees since they are too high for our lift. We decided to use a crane to lift me into the top, where I could do my work with a secondary anchor (lanyard/spikes plus the crane load line). When finished, I just had the crane move me to the next tree! No climbing up and down! Everything was very safe, controlled, and simple. I trimmed all 4 trees in under an hour. Click on the photo to get a larger version!